Recently we have been asked to read several ineffective community development grant narratives that non-profit and neighborhood organizations have submitted. We decided to show you some sample poorly written sentences excerpted from actual applications for funding, with suggestions for improvement shown in parentheses. We hope this is helpful in improving your success rate as you seek external funds for your important work in your neighborhood. 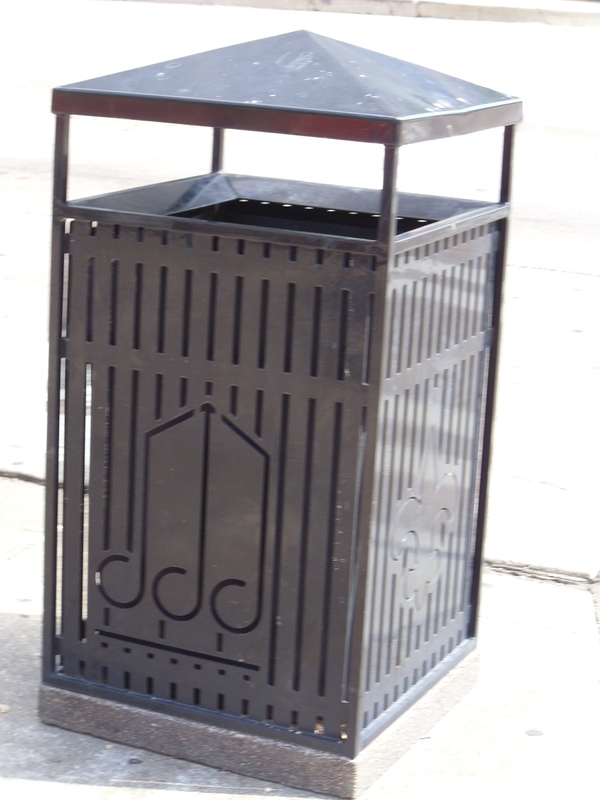 You might be seeking money for trash cans with personality, such as the one pictured on this page, or new benches for your business district, which we will use as our example. If you want support for a social program or children's initiative, the principles will be the same. We start with some actual sentences from community development grant narratives. Remember our comments on these real-life example sentences are in parentheses. 1. Make your writing concise and compelling. If the funding organization publishes a narrative word limit, be sure to observe it. Sometimes a grant officer will give you advice on a narrative length, even if there is no firm rule. Pay attention. But if you have a 500-word limit, pack those 500 words to the brim with buzz words reflecting the funding organization's priorities and interests, the most dramatic statistics you can find from reliable sources about the impact of your program, slightly unusual and evocative words as opposed to boring and everyday words, and emotional examples of how your program can impact society, a target population, or a location of mutual interest to your organization and the funder. 2. In addition to great writing, make sure that you use proper grammar and impeccable spelling. If you submit the application on paper, take time to assure a clean, neat appearance and quality printing. 3. Follow the advice of the grant maker on the content of the narrative. Community development grant narratives should not repeat information requested elsewhere in the application unnecessarily though. On the other hand, if a part of an earlier answer is relevant to the current question, at least refer to the earlier answer briefly; if it is a key point of your entire application, repeat the content but use fresh wording. To make sense, your community development grant narratives often need to repeat data shown on fill-in-the-blank portions of the application form; a small amount of this repetition is fine, but if it needs to be extensive, feel free to refer to your answers to previous questions. 4. If the application does not allow you to do so elsewhere, it is critical to use community development grant narratives to include all the information to explain your proposal. We suggest that you scramble the journalistic 5 W's and try this order of presentation: what, where, why, who, when. Typically the where and the when of community development grants can be described very briefly, although the "where" should give specific buildings or locations if relevant and "when" should give specific dates if events are involved. If the application form covers almost all of the "what" adequately, concentrate very heavily on "why," and give as little or as much explanation as necessary to tell who will be participating. 5. Look all over the internet and in professional or trade sources to find relevant data, statistics, prices, and numbers in general. Count things yourselves if necessary. Use this information carefully to support your case. 6. Use sources for any statistics or research findings to the extent possible. Your community development grant narrative shouldn't assume that a grant maker will believe you just because you say half of all mothers are also grandmothers. When sources are numerous, select the one with the most sterling reputation. For most funding organizations, you won't need footnotes. Use a sentence such as "According to the Urban Institute, 67 percent of all mothers are also grandmothers." Funders that will require an exact citation usually will let you know that. 7. Gear your narrative to the reader. If the funder is very familiar with your organization and your leadership, you can afford to spend less time touting your competency to do the project, and more time explaining why this application is particularly apt. Even in that event, however, be careful to address all important points briefly, since you never know when the funder will ask for input and evaluation from an outsider who is less acquainted with you. 8. Be sure to use the narrative to underscore how application strengths match up with selection criteria. Don't be afraid to specifically reference scoring criteria and to organize your all or part of your narrative by demonstrating the outstanding applicability of your project to each criterion. If you have room, you can summarize the match in a table. Just be brief if that information is contained elsewhere in the application; you can even reference the part of the application that gives a more detailed explanation. For example, you might say, "As explained in more detail in response to question 9A, we plan to contract out meal service." 9. Unless specifically forbidden to do so, consider including photographs in your narrative. Place each photo adjacent to a point being discussed. In our example, you could use photos of missing boards in benches. These days there is little excuse for a poor quality photograph in a grant application. 10. If you are approaching large foundations or corporations that work beyond your own city, it is worth pondering current trends in foundation thinking. We stress foundations, since corporations often look to the foundations for guidance on trends in giving. If this interests you, see the Council on Foundations article on the current thinking of foundations with respect to community development. Note: You may want to enjoy our three-part series on neighborhood associations, in addition to checking out one of these.